Mathematics and computer science are behind today’s technological wizardry… Let Andrew McPherson, both scientist and musician be your guide into the world where computing and traditional musical instruments collide. 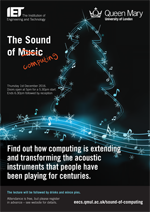 This special one-off Christmas event - co-hosted by the School of Electronic Engineering and Computer Science at Queen Mary, and The Institution of Engineering and Technology (IET) - will be a fun-filled evening full of surprises. The evening is aimed at secondary school aged students, but with surprises to be unveiled for both adults and young people alike. All are welcome so if you have a curious mind, book your (free) tickets below quickly as places are vanishing fast! Andrew McPherson is a Reader in Digital Media at Queen Mary University of London. He is a member of the Centre for Digital Music (C4DM), a research group in the School of Electronic Engineering and Computer Science which explores the overlap between music and computing. Within C4DM, he leads the Augmented Instruments Laboratory, a team whose projects have been featured in two successful Kickstarter campaigns, concerts in high-profile venues including the Barbican Centre and Cadogan Hall, and over two dozen media articles.